A stroke is a decrease in blood flow to a region of the brain. Blood carries oxygen and nutrients through blood vessel called arteries. Any compromise in arterial blood flow in the brain deprives the brain of necessary oxygen and nutrients. This causes a loss of function of the portion of the brain supplied by a particular artery. A stroke manifests as a group of symptoms caused by the loss of function of a portion of the brain. The part of the brain affected by a stroke corresponds to a particular blood vessel. When a blood vessel is blocked or damaged due to a leak or a rupture, this causes blood supply to slow down or stop. The blood vessels that supply the brain correspond to a portion of the brain, following a well-defined pattern. Some areas in the brain may receive blood from more than one blood vessel, but usually, one blood vessel provides the majority of blood to a particular brain region. The following is a list of blood vessels that, when injured, cause a stroke. Carotid arteries: The carotid arteries are in the front of the neck and provide the majority of blood supply to the brain, particularly the front of the brain. Carotid arteries are in the neck, so they are more accessible than blood vessels in the brain itself. This allows doctors to evaluate the health of the carotid arteries using equipment such as ultrasound to see whether the carotid arteries are narrow or have large amounts of cholesterol build up. Carotid arteries are also much more accessible for surgical repair than blood vessels located deep in the brain. Vertebral arteries: The vertebral arteries are in the back of the neck and supply blood to the back of the brain. The vertebral arteries provide blood to a relatively small portion of the brain, the brainstem, but it is the part of the brain that controls life-sustaining functions such as breathing and regulating the heart. Basilar artery: The basilar artery is the merging of the vertebral arteries farther up and deeper in the brain. It provides blood to the brainstem, which controls eye movements and life-sustaining functions. Anterior cerebral artery: The left and right anterior cerebral arteries are branches of the left and right carotid arteries, respectively, and they provide blood to the frontal region of the brain, which controls behavior and thoughts. Middle cerebral artery: The middle cerebral arteries are branches of the left and right carotid artery, respectively. 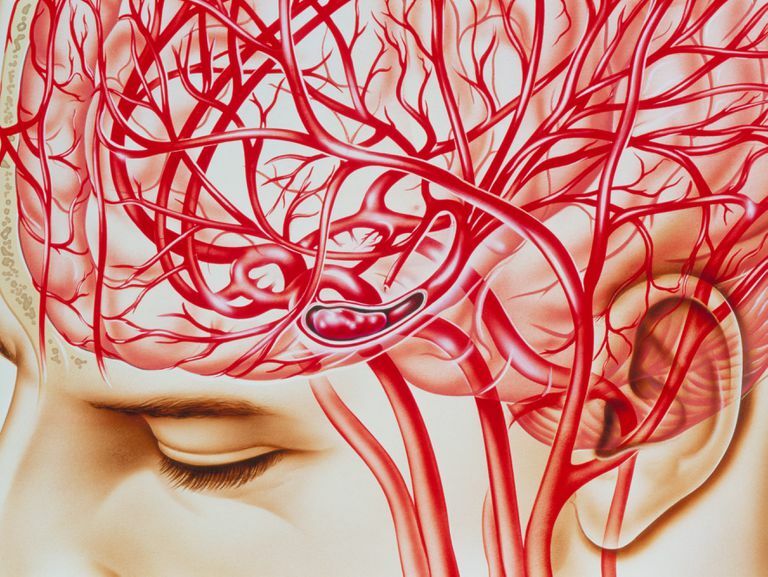 The middle cerebral arteries provide blood supply to the areas of the brain that control movement. There is one middle cerebral artery on the left side of the brain and one on the right side of the brain. Posterior cerebral artery: The posterior cerebral arteries branch off the basilar artery. The right posterior cerebral artery supplies blood to the far back right region of the brain and the left posterior cerebral artery provides blood to the far back left region of the brain. Posterior communicating artery: The posterior communicating artery allows blood to flow between the right and left posterior cerebral arteries. This provides a protective effect. When one of the posterior cerebral arteries becomes a little narrow, the posterior communicating artery can compensate for mild narrowing by providing blood from the other side, like a tunnel or a bridge. Anterior communicating artery: The anterior communicating artery is a connection between the right and left anterior cerebral arteries. This blood vessel, like the posterior communicating artery, provides a link between the right and left anterior cerebral arteries, which offers a protective effect for mild narrowing of one side by allowing the sharing of blood supply from the other side. Ophthalmic: The ophthalmic arteries supply blood to the eye and therefore provide important nutrients for vision and eye movement. Retinal: The retinal arteries are tiny blood vessels that provide blood to a small but very important part of the eye called the retina. Find out more about retinal artery stroke. When an area of the brain lacks sufficient blood supply, a stroke may occur. The combined symptoms help health care providers determine the location of the stroke and which blood vessel is affected. This can help in the long-term and short-term treatment and recovery plan. Martin Samuels and David Feske, Office Practice of Neurology, 2nd Edition, Churchill Livingston, 2003.